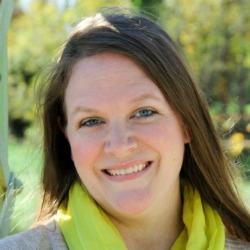 When I realized that gluten was one of my triggers I wasn’t too sad about the foods I would miss. However, there were a few things I knew I would miss. 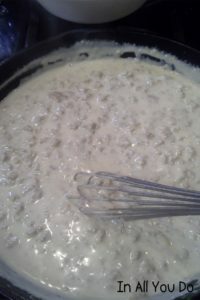 Biscuits and gravy was one of the favorite foods. Whenever I would go out for breakfast growing up and even in college, I would almost always order biscuits and gravy. I prefer it over pancakes any day. 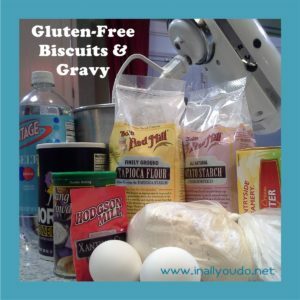 So, I set out to find an easy and delicious gluten-free biscuit and gravy recipe. I came across this one that had rave reviews. So, we bought all the different flours and gave it a try. And boy did it deliver!! 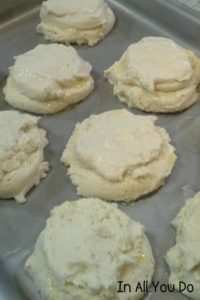 I was pleasantly surprised that I could hardly tell the difference between the GF biscuits and regular ones. I probably could have made myself sick on them, but I decided to stop with just one. Even the Hubster and Mister Bull loved them!! Maybe switching the family to Gluten-Free won’t be as difficult as I thought! 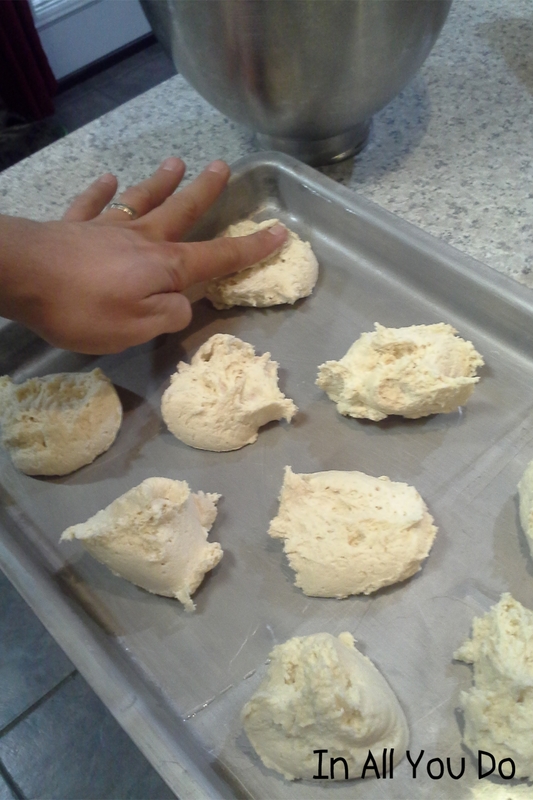 Scoop remaining dough on top and press down with wet finger. Typically you want your bottoms and tops to be similar in size. But, I got a little carried away with the bottoms, thus making my tops a little smaller. Trust me…it did not alter the taste in any way! Bake at 400 degrees for 17-20 minutes. The won’t brown much, so make sure they are completely done. Now for the gravy. Brown the Turkey Sausage while your dough is setting up in the fridge. Remove the sausage from the pan and melt the butter. Add flour to melted butter and whisk to make a rue. 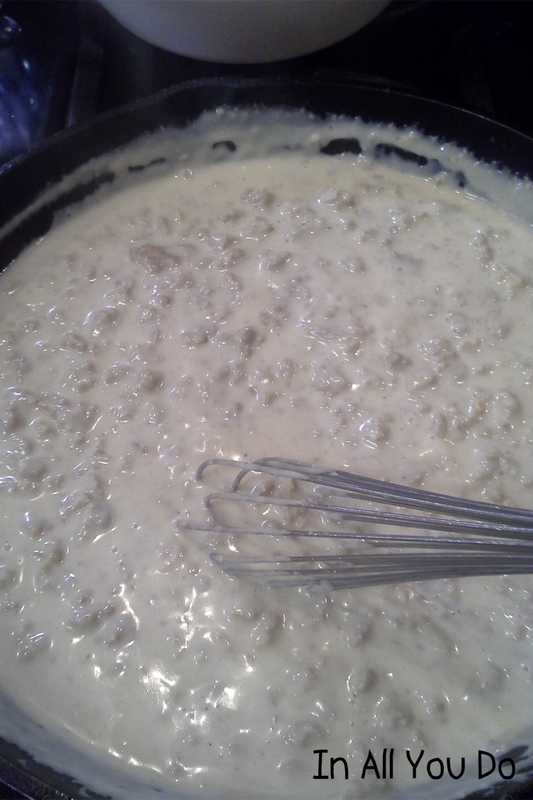 SLOWLY add milk to your rue and continue whisking. While you’re whisking, add seasonings. Continue whisking over medium heat until mixture thickens. Add the sausage back to gravy mixture and cook to desired consistency. 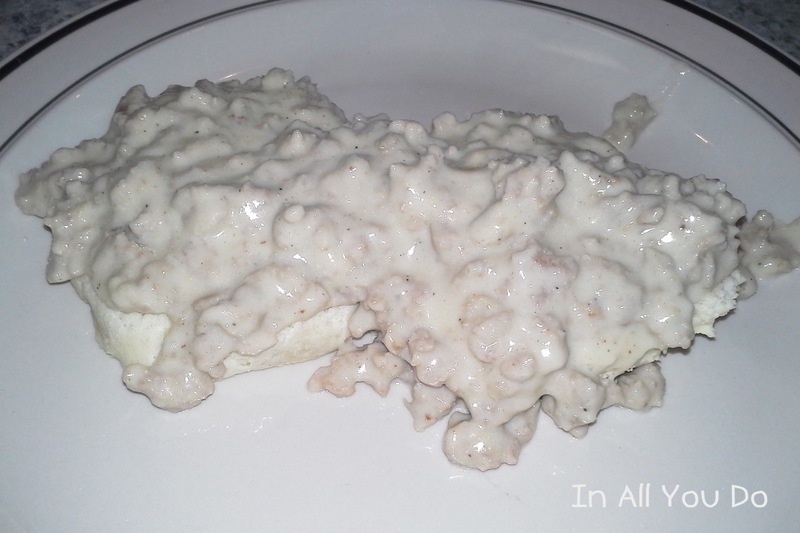 Pour turkey sausage gravy over a split biscuit and enjoy!! Preheat the oven to 400 degrees. Spray a 13×9 pan with oil. 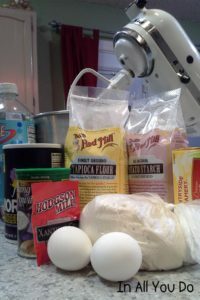 *Combine the tapioca flour, brown rice flour, potato starch, baking powder, xanthan gum and salt in a mixing bowl. 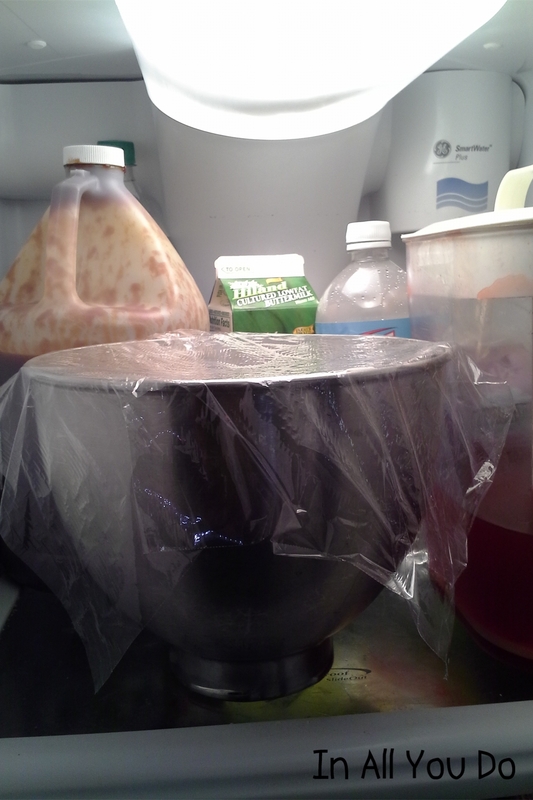 Next add the 1/2 cup melted smart balance and mix well (I used a mixer with a paddle attachment). 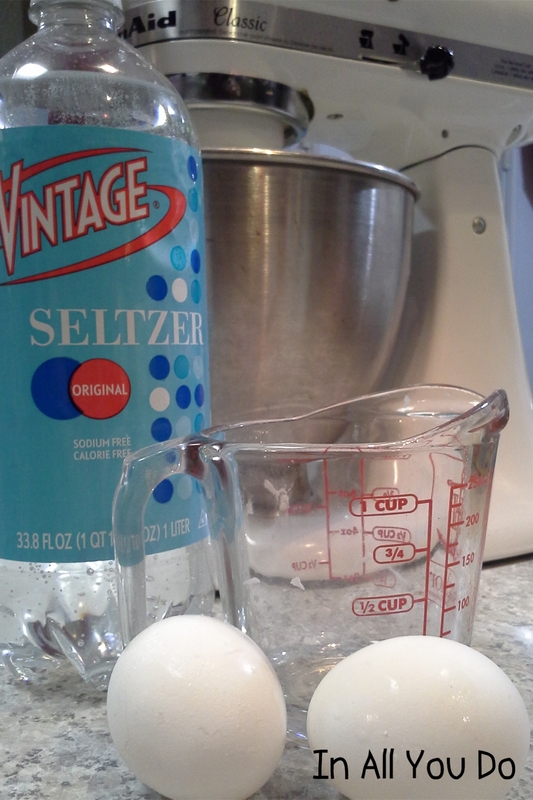 *Then add the seltzer water and eggs to the flour mixture. Mix well. *Refrigerate the mixture for 30 minutes. *Using a 1/4 cup cookie scoop, scoop dough into 9 biscuits in prepared pan. Wet your fingers and press the dough down a little. *Next put about 1/4 tsp melted smart balance on each piece of dough. 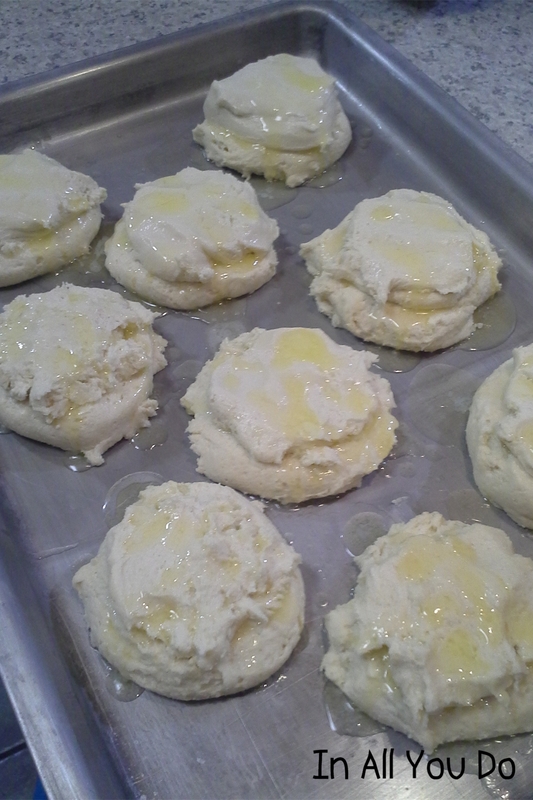 *Now scoop another mound of dough on top of each of the buttered mounds. Wet your finger again and press the mounds down a little. *Now put the rest of the smart balance on top of the biscuits. 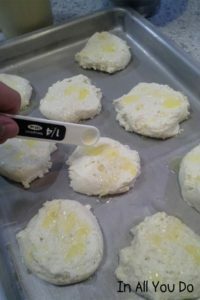 Bake for 17 to 20 minutes. *They don’t really brown much, so just make sure they are cooked through. 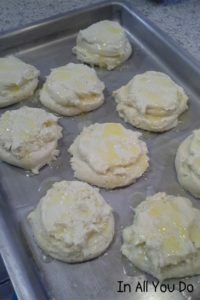 NOTE: I use the scoop to keep clean up down to a minimum and by layering two scoops together with butter in the middle, it creates a perfectly buttery spot to pull them apart for filling! 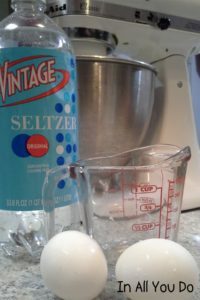 Also, the seltzer water is like magic with baking stuff like this. It really does help give things a little lift! *Brown the sausage until cooked through. Remove the sausage from the pan. *Add butter to the pan and melt. 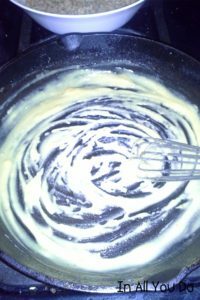 Whisk flour into melted butter to make a rue. 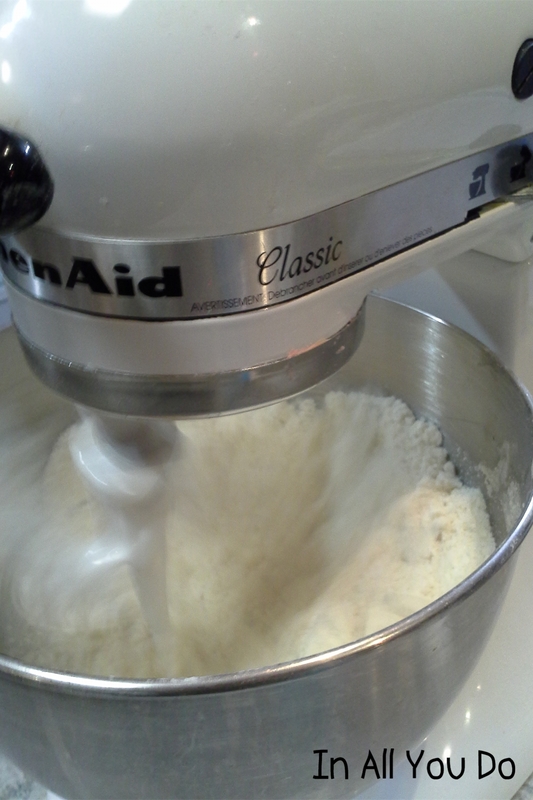 *SLOWLY add the milk to the butter and whisk. 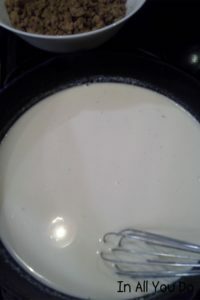 Once all the milk is added, add your seasonings. *Whisk over medium heat until the mixture thickens slightly. *Add the sausage back to the gravy and cook to desired consistency. 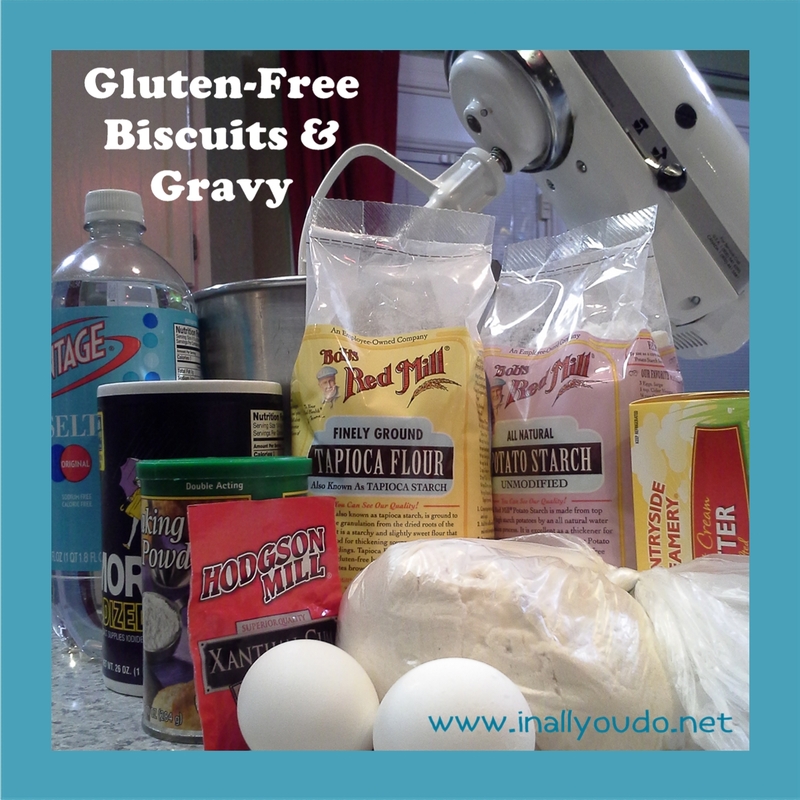 Do you have a favorite Gluten-Free bread recipe? 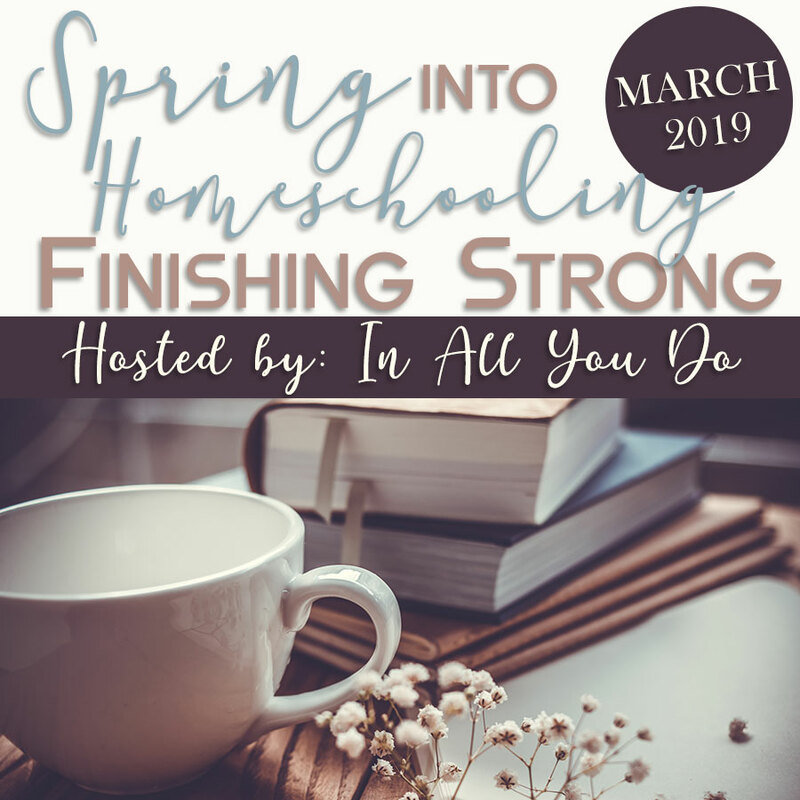 Feel free to leave a link in the comments!! Thanks for stopping by on this beautiful Hump Day!! 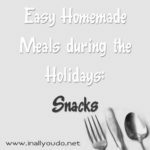 Thanks for sharing this recipe – I know I’ll be giving it a try! 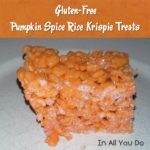 I’m always on the lookout for gluten free versions of foods that used to be my favorites. You’re so welcome!! I’m really getting into the cooking of it now. It was so overwhelming at first, but now I’m getting the hang of it! 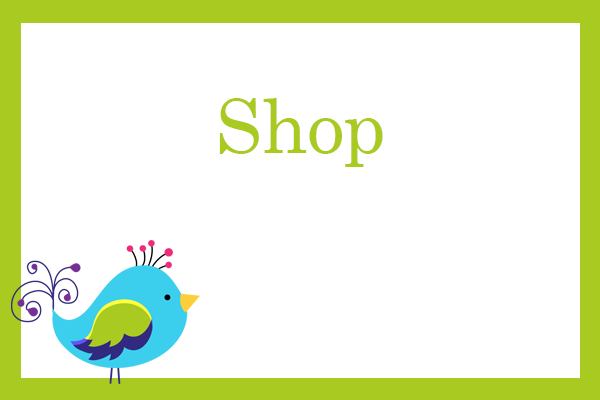 I hope you’ll stop by again to see more of my recipes. I try to post one every Wednesday. We’ve just found a new blend that we’d like to try, so I hope to share about that in the next few weeks! !